Purchasing a home is such a large part of the American dream that nearly everyone aspires to achieve the goal of becoming a homeowner. Buying your first home is a big deal, and a decision that will impact the rest of your life – not to mention your pocketbook. When done the right way, homeownership can be both a great financial and emotional decision. However, if you are not adequately prepared, the financial stress of owning a home can make you feel as if you are on a rapidly sinking ship. The good news is that careful research and a thorough self-evaluation, can help you determine whether the timing is right for you to become a homeowner. So, before setting sail on the homeownership voyage ask yourself these questions to know how to figure out what house you can afford, or even if homeownership is in your near future. 1. Is My Financial House in Order? Before even considering purchasing a home you must take an honest look at your debt. If you are like millions of other Americans, it’s likely that you have racked up thousands of dollars in student and automobile loans and your share of the trillion dollars of America’s credit card debt. If you are suffocating with multiple debt payments, or even just have one large debt that is difficult to pay off, this is not the right time to take on a home loan. You don’t want to add a mortgage and all the other expenses that come with homeownership (taxes, insurance, HOA fees, repairs, etc.). Be patient and attack your debt before considering this next large and expensive step. You can restructure your debt for an accelerated payoff by using our debt restructuring calculator. 2. Do I Have an Emergency Savings? Financial experts recommend an emergency savings of at least 3-6 months of income stashed away for any unforeseen event. This fund could prove more important than ever once you become a homeowner. Being a homeowner brings with it responsibilities that do not come with renting, along with the probability of unexpected and expensive repairs. Financially planning for repairs to your air-conditioner, a faulty furnace, a leaky roof, along with a host of other unforeseen expenses with an emergency savings will keep you able to meet your monthly obligations when misfortune heads your way. Have a well-established emergency savings before buying a home. Our emergency fund calculator can help you determine how much you need to set aside for an emergency. 3. Do I Have Enough Saved for a Down Payment and Closing Costs? In addition to an emergency savings, you will also need to set aside as much money as you can for a down payment. While there are many loans with low down payment options, 20% down can earn you a lower interest rate, keep you from paying PMI (private mortgage insurance) and ensure more equity from the start. If you can only afford a low down payment option of 3%-5%, you might want to consider saving up money and postponing purchasing a home for when you are more financially prepared. In addition to the down payment, you will also need to save for the closing costs. Keep in mind that home buyers need to pay between 2%-5% of the purchase price of their home in closing costs. This can add up quickly when you consider fees for a $150,000 home could be as high as $7,500. Combining the down payment with the estimated closing costs, will give you a good idea of the cash you need to come up with to purchase a home. 4. Have I Run the Numbers? Knowing if you are financially ready to be a homeowner is all in the numbers. A few numbers to remember are 28%, 32% and 40%. When considering how much house you can afford, it is wise to consider the 28% rule – meaning your mortgage payments should not exceed 28% of your total monthly gross income. This number needs to include principal and interest payment, real estate taxes, mortgage insurance (if applicable), and homeowners insurance. Try using a home mortgage calculator to get an idea if you are financially ready to be a homeowner. Since there are a variety of costs associated with being a homeowner, it is wise to not exceed 32% of your gross monthly income going toward your housing costs. If you follow the 28% rule, you can allocate about 4% more of your income going towards home repair or other associated housing costs. Another percentage to keep in mind is 40%. Experts agree that your total monthly debts, including your mortgage, should not exceed 40% of your gross monthly income. In fact, it is ideal to have it much lower. Banks will look at your income to debt ratio and decide if you are a good candidate for lending. The lower this percentage is, the better shape you will be for lending purposes, and for your own financial stability. 5. Am I Ready to Put Down Some Roots? Life is full of surprises and change is always something that you can expect, but if you want to purchase a home, you also need to be ready to stay put for a while. 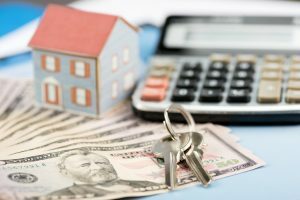 Buying a home can be expensive, and coming up with a down payment, closing fees, and moving costs can prove to be a prudent financial investment if you plan on staying in your home for at least five years. Building equity takes time, and it will take several years to recoup all the money you have put into purchasing a home, which is likely to prove to be one of your largest investment. If you decide to buy a home, make sure you take the steps needed to purchase a home in a community you want to live in so that you are not tempted to move prematurely. Purchasing a home is not just a financial decision, it is an emotional one as well. Asking yourself these important questions and doing what it takes to plan for such a large purchase will prepare you to set sail on a successful home buying voyage. What are some ways that you financially prepared to purchase your first home?